Shown below are some great deals on limited quantity merchandise. Be sure to check back here for new items and/or changes. Beautiful solid cherry wood plaque - includes 1 logo and 100 letters laser engraved. (Vector artwork file for logo must be furnished - click here for artwork info) Regular Price: $80.00+++! Click on image to see larger picture in new window. 2013 Click here for more lasered plaques. 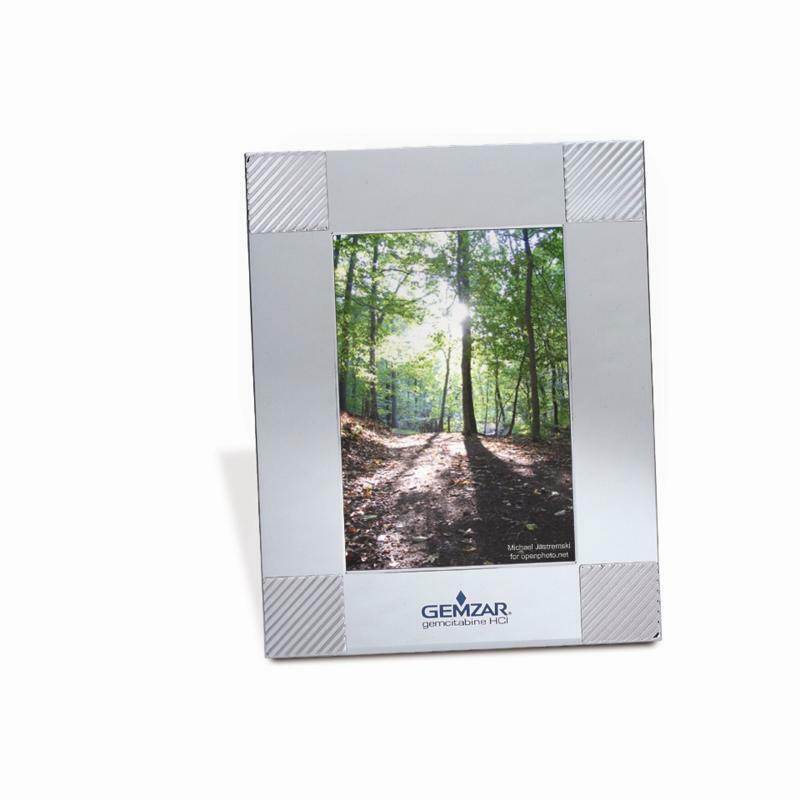 Four-color-process screen-printed photograph on a brass plate with space for your personal, engraved message above and below picture. No "pre-printed copy". REGULAR 2008 PRICE: $67.56. ONLY 1 LEFT... HURRY!. Click on image to see larger picture in new window. 2011 Prices do not include engraving. Please refer to imprint info page. Click on image to see larger picture in new window. 2011 Prices do not include laser engraving. Please refer to imprint info page. 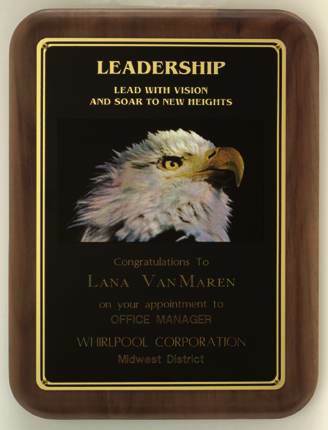 With these over-stocked plaque boards, we've put together a beautiful combination of brushed and polished gold engraving plates and medallions (from our Stock VIP Corporate Series). REGULAR PRICE: $75.00. 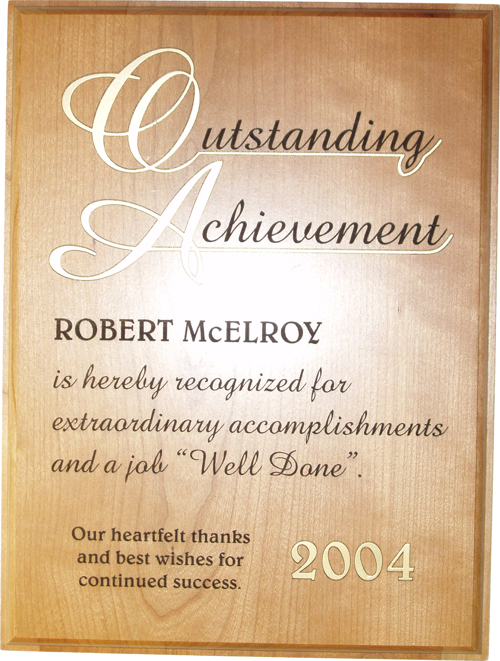 Quality walnut & brass perpetual plaque - take advantage of our over-stocked inventory! Header plate is 2" x 6¼" Black Brass (engraves through in gold), and perpetual plates are 7/8" x 2-1/2". Price does not include engraving. 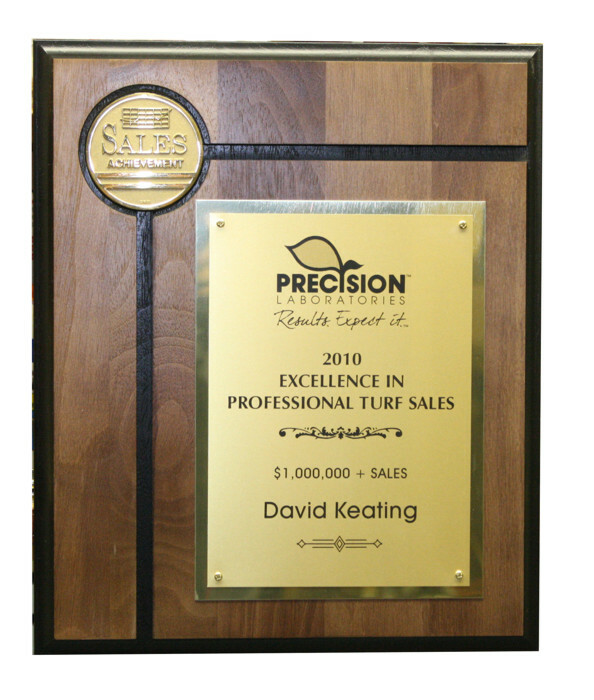 Quality walnut & brass perpetual plaque - take advantage of our over-stocked inventory! Regular price: $74.40. Header plate is 3½" x 7¼" Black Brass (engraves through in gold), and perpetual plates are 1" x 3¼". Price does not include engraving. 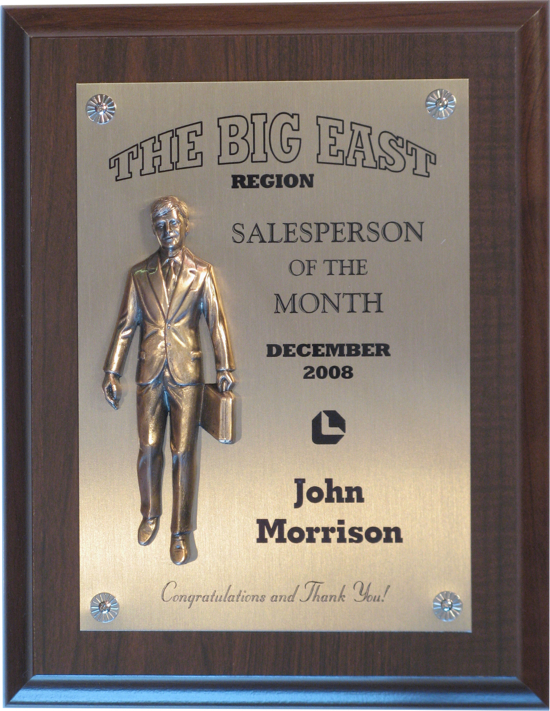 Quality finished, metal salesman casting on antique bronze-finish aluminum plate (great for sublimated imprint). While supply lasts! Regular Price: $49.95! Click on image to see larger picture in new window. 2011 Prices do not include imprint. Please refer to imprint info page. 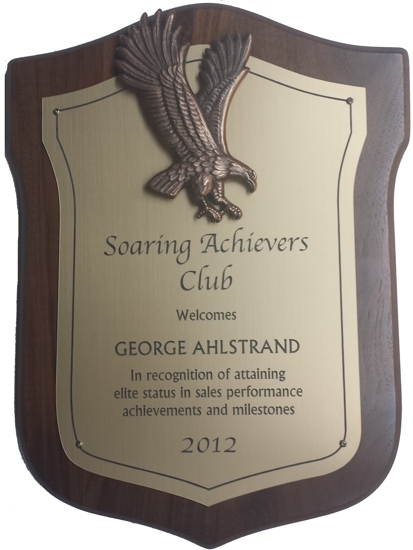 Solid American Walnut plaque with cast bronze-finished eagle. (Deduct $20 if you do not wish to have the eagle casting) While supply lasts! Regular Price: $130.00! Click on image to see larger picture in new window. 2012 Prices do not include imprint. Please refer to imprint info page. This is a Classic Design Exclusive! 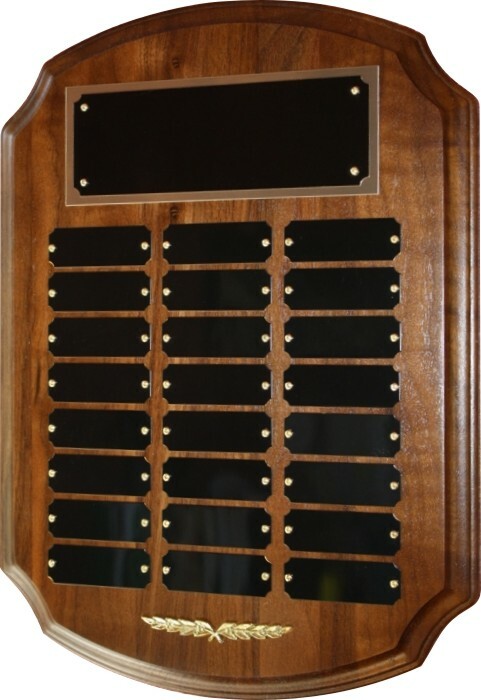 Perhaps you have a corporate logo that would be graciously complemented by the oval-shaped plates, or you're just looking for something different to recognize monthly winners. Perpetual plates are bright brass (1 x 3 approx.) 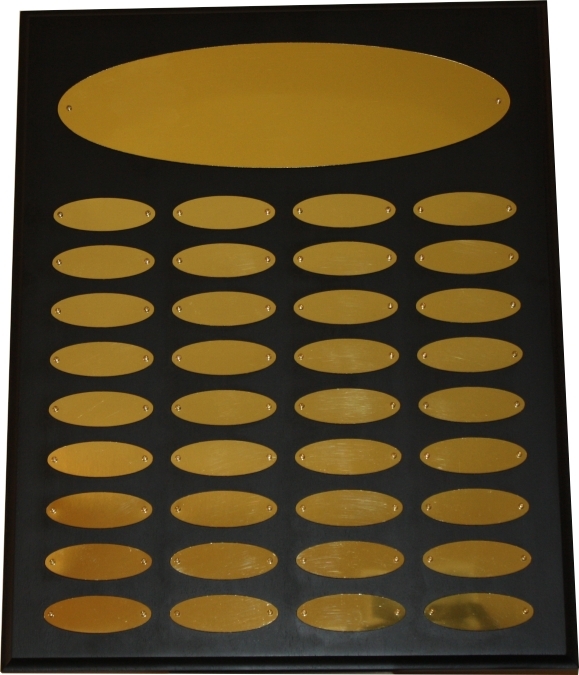 and header plate is 4" x 13½" matching bright gold/black, 2-ply plastic. Black-lacquered board (L- prefix) or Walnut (W- prefix). 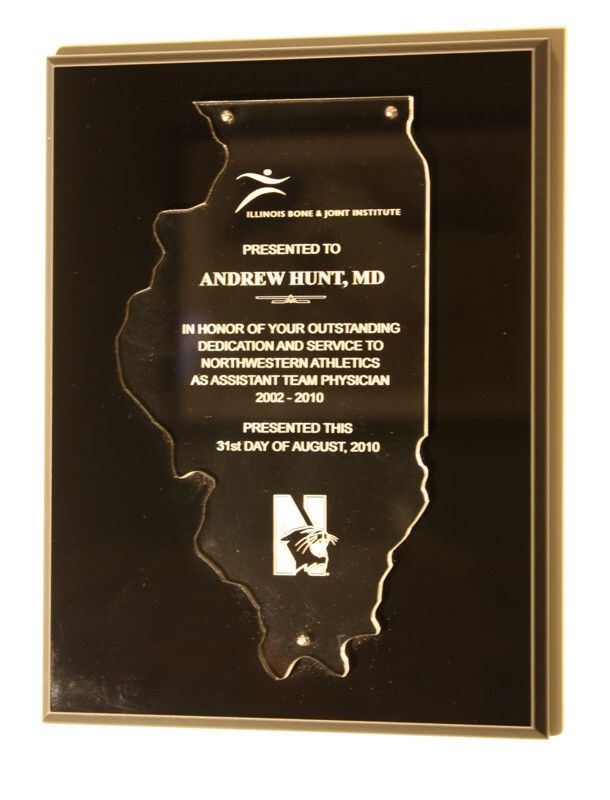 We are over-stock on these plaque boards and oval plates, so this is priced to move! Check other 36-plate plaques and you'll pay $300 (and more!). Prices do not include engraving. Please refer to imprint info page. 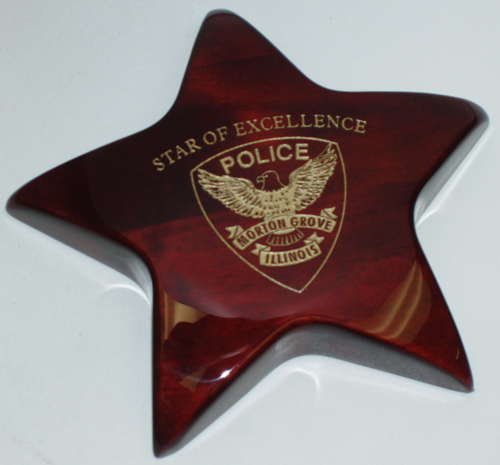 Beautifully finished, high gloss Star Paperweight Award. See laser engraving prices. Gold or Silver color-fill only. Click on image to see larger picture in new window. 2009 Prices do not include engraving. Please refer to imprint info page. Solid brass door knocker, includes engraving. Brass mounting hardware included. Click on image to see larger picture. 2009. 17 pieces left in stock! Plastic trophy figures. 20 of each left. Use these on a trophy from our "Classic Profiles" page and receive 10% off on those trophies. 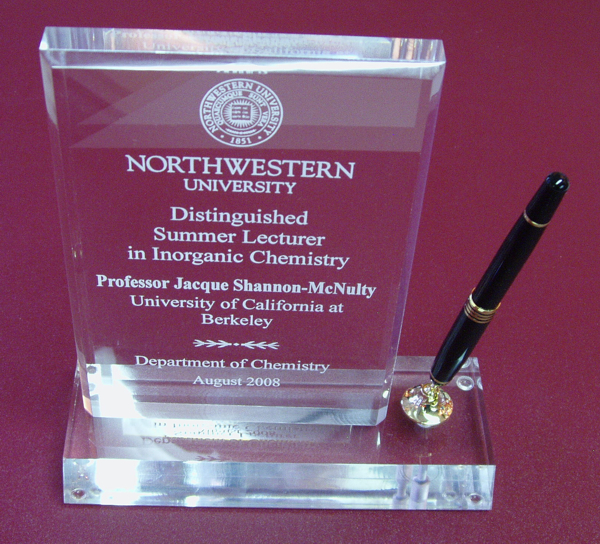 Signature SeriesTM Ribbon Mylar Holder includes a 2" dia. activity disc (click here for a list), and engraving. 0 pieces left in stock! Click on image for larger picture. 2009. 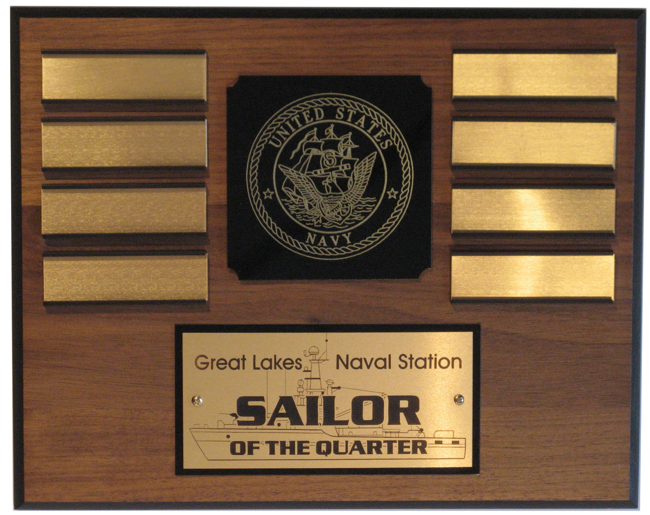 7/8"x3" engraving plate, post on back for free-standing award as well as hanger on back. 13 small and 9 large available. Click on image to see larger picture in new window. 2009 Engraving: $2.50 per plate. 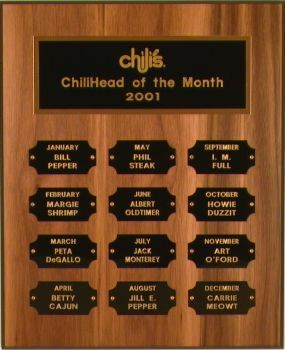 Click on plaque to view larger image. Click Here to see more from our "C-O-N-G-R-A-T-S" Perpetual Award Programs. Let us know what you would like engraved on the top (header) plate. You get 50 letters included in price. Logos are extra - contact us for quote. 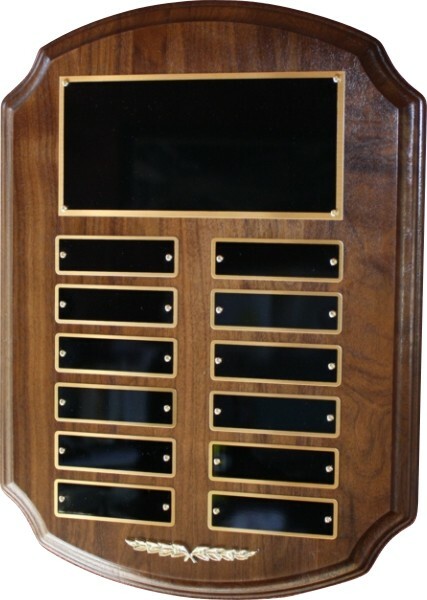 We will send your plaque, via UPS, in about 1 week. 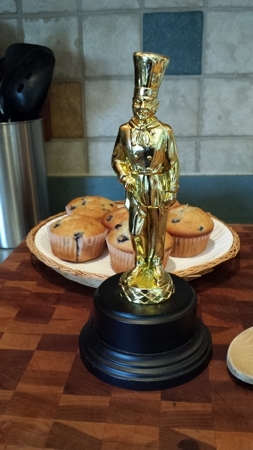 Be sure to display it where lots of people will see it, so your winners get plenty of recognition! We will include a screwdriver for attaching future monthly plates. *Time may vary, depending on season. Allow for standard delivery of 1st Class Mail. These boxes are sure to please. There's plenty in stock and work great for that last minute idea. Please e-mail us if you would like to order or see a sample. 99-1003 7-1/2" W x 5-1/2" L x 2-1/4" D Mahogany-Finished box with cast pewter inlay and plate. Use for jewelry, pens, glasses, knick-knacks, desk-top items & more! 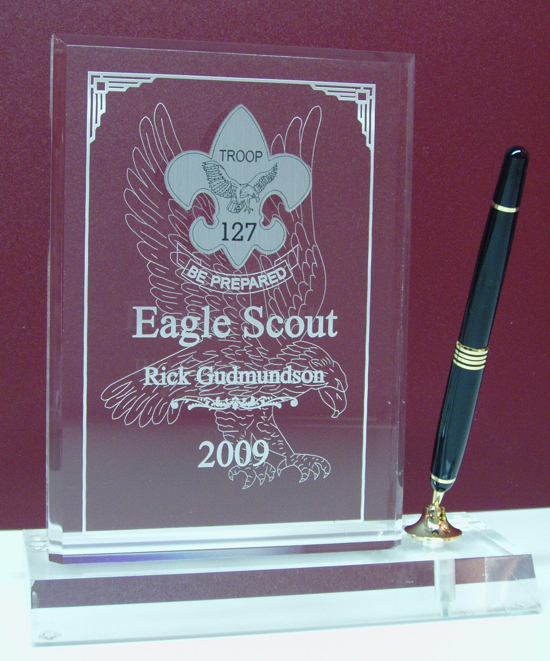 Imprinting: Plate can be engraved (see "Engraving Info") or screened - contact us for pricing. Copyright © 2005-2011 Classic Design Awards, Inc.. All rights reserved.